The 3rd Hawaii-Korea International Tourism Seminar was held in Hawaii last month at the Waikiki Resort Hotel in Honolulu, travel magazine Travel Press said Thursday. At the event, hosted by Travel Press, around 150 participants discussed ways to meet the changing patterns of Korean tourists as well as ways to embrace the increasing number of tourists and to develop new travel products. The seminar is the third of its kind since 2010 when it was launched in commemoration of the 30th anniversary of the publication of the magazine. Suh Young-kil, consul general of Korea, and Hawaii’s Lt. Gov. Brian Schatz attended the event. Among the dignitaries were Hong Sung-won, president of Web Tour; Emily Kim, marketing director of Hawaii Tourism Korea; John Jackson, vice president of marketing at Korean Air U.S. headquarters; and Monisa Cline, vice president of worldwide sales at Hawaiian Airlines. Participants at the seminar discussed the changing travel patterns of Korean tourists since 1989 due to the rapid expansion of the Internet and social networking services. Consul General Suh said that due to the increased flights between Incheon and Honolulu, the number of Korean tourists to the island has also increased and therefore is contributing greatly to those in the tourism industry. 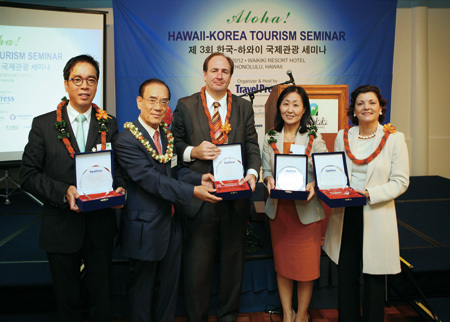 He said he hopes the seminar will contribute to the development of the tourism industry in both Korea and Hawaii. Lt. Gov. 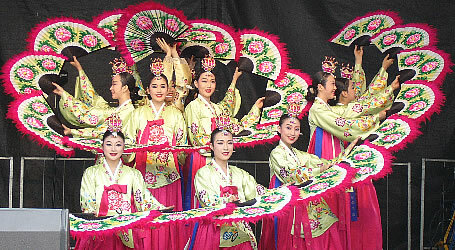 Schatz said the Hawaii Tourism Office was doing its best to embrace the growing number of Korean tourists and that the Hawaii government will soon sign a memorandum of understanding with Jeju Island in Korea to adopt smart grid and the green energy technology. Sho Jae-pil, publisher of Travel Press, said he wished to contribute to the tourism industry in both countries by finding ways to resolve the lack of hotel rooms and travel guides.